James, our director in Freetown sent me this post to be added to today's blog. The internet server in Freetown is very slow today, kicking in and out. James had to type quickly, get the word out and upload the pictures to me. It's remarkable that he got anything out to me at all. 12 May 2008 by James Mansaray, Freetown: Before taking another trip checking on the school construction in Kabala , I had been following events and issues around our beloved Salone the past few weeks. Some good ones and some hurting news. All this seen as part of life. For some it is tolerable whilst for others, not too good at all. As a member of Nazareth House Apostolate, we always spend time as a family to pray asking God to take control over it and wishing we had the support to improve on it. Sierra Leone was recently aired around the world as paying the highest for petrol, this true. More increase in our staple food rice when there is enough poverty. Recently in Kabala two sad incidents where in a girl killed a young man with a scissors out of frustration (photo above) and a lady cutting her husband’s secret part off just because the husband fails to meet his family needs. 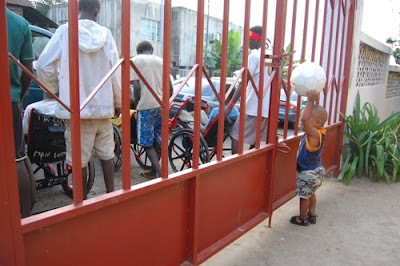 More and more beggars around the streets of Freetown asking for a coin or more (photo above Roo w/ soccer ball looking out at beggars lined up in front of St. Laurence House), the new government doing its best trying to improve things. But in the mist of global rising prices few good results are achieved. With Nazareth House Apostolate on the ground trying to help in our own way few plans were made. Primarily to pray and then ask for more support so that we continue to do our work here. Those who had been checking the blog will find a column where in we made up a plan to help improve swamp rice farming in Kabala. But the question is, can you fix square pegs on round holes? We trying to bring smiles; are not relenting to ask... but pushing and calling on many to help us meet our goal here. The need for a compound our top priority and more and more needs behind it. Oh how i wish to see this come true because renting a house is one of the biggest killing prey here in Freetown and its getting worst day by day. 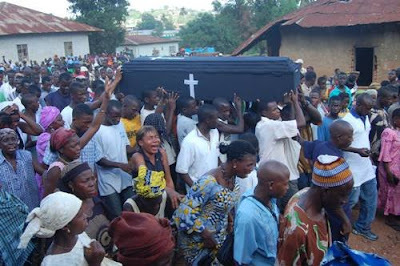 Ask any resident of Freetown about this and you will hear the different cries about it. Last night I took time to ponder over the recently made DVD on the work of Nazareth House Apostolate here in Sierra Leone. Little be it or not the pictures said it all. We are up to something but we can’t do this alone. Two days ago I was doing a picture job at the Freetown golf club down Lumley and I saw three things. A fire dancer impressing a group of people, a beautiful sea view, some small kids walking along the beach carrying heavy stuffs on their heads to help fix a new family home. The last scene spoiled the whole show. Nazareth House Apostolate is here for it and with your supports we can help bring smiles to many sad faces here. See how this little lad is in this picture.